A great self defense round for the person who uses a shotgun at home for things that go bump in the night. 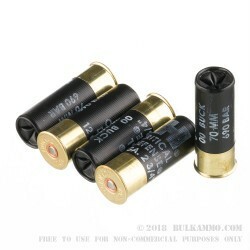 This is a heavy hitting 00 Buck shot load with a massive velocity (1600 fps) 8 pellets and in a 2 ¾” shell, giving you full capacity on most magazine tubes without sacrificing much to move down from a 3” shell. Hornady is premium, the price reflects that, but it leaves you wanting nothing when it comes to quality control, load quality, fit and finish; reliability and terminal ballistics. This is a true powerhouse of a round for the 2 ¾” cartridge size and gives you the confidence for any number of scenarios when you need your ammunition to work the first time every time. The groupings are tight, the lead delivery in CQB (Close Quarters Battle) where this ultimately makes a lot of sense, is massive. The potential for stopping an intruder cold the first shot is very high. The Hornady load is proven in law enforcement departments across the country daily. It’s just a very good load, and while it is pricy, you are getting a lot of bang for your buck. Q: How long can this product be stored, and under what conditions, to maintain potency? A: Store the ammo in a cool (not cold), dry place, away from direct sunlight. 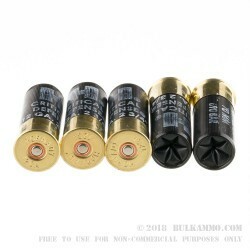 Sealing the ammo from outside air and moisture is also an excellent idea. Q: Will you be selling the Hornady Zombie Max ammo? A: In small quantities, yes. 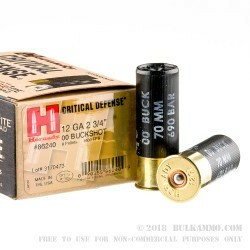 Q: What is the difference between the Critical Defense buckshot and say, Remington buckshot that is used for hunting? 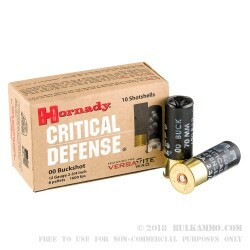 A: The Hornady Critical Defense 12 gauge buckshot, due to the "VersaTite" wad which is utilized with this ammunition, generally delivers a tighter pattern (smaller group size) at extended ranges when compared to other brands.